Thick skin. I want it. At times, I even pray for it. I imagine it folding over me like an ill-kneaded pizza dough that edges out in a crust so sharp it cuts between your teeth and a flimsy center, pooled with sauce. Oh, Lord, let me sit here and grow hard in the exposed light of day. Then no one would dare want to eat me. But I know better than most that a thick skin suffocates the life out of the very thing it protects. 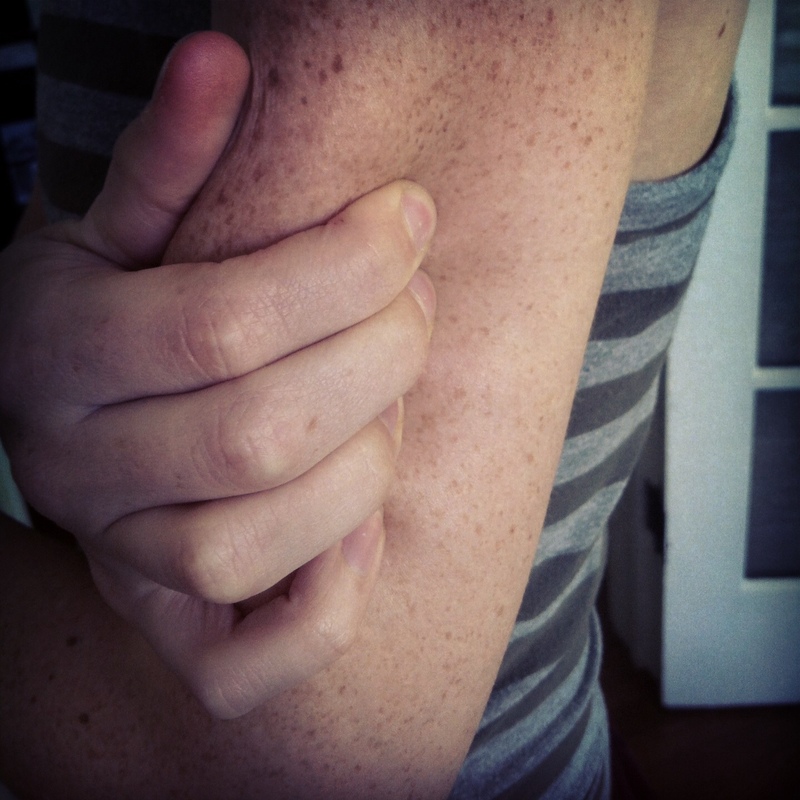 When I was eleven, I noticed a patch of scratchy skin beginning to form on my upper arm. I tried to rub it off hard in the shower like it was flakes off a sunburn, but it persisted. It wasn’t scaly by the time I went to the doctor for a biopsy. Like a snake, it had shed its exterior and revealed a smooth, leathery patch of skin that slithered beneath my freckles. It was the autoimmune disease scleroderma, a word from the Greek meaning “hard skin.” Even if we treated it, it could still kill me. I was fascinated by this animal skin. I crossed my arms in front of my chest and squeezed my left arm with my right hand and the right arm with the left for comparison. The healthy arm could be pressed into pinch-able folds of skin. But the other arm would not budge, instead moving as one hard mass. First it was only a few inches long. Then it was ten. The doctors gave me a cream to rub over the arm each day. It gave the skin a whitish sheen for the next few years that drew attention during volleyball matches and pool parties. I relished telling people I had a life-threatening disease as if it somehow validated all the drama I was feeling as an adolescent trying to make a home in my ever-changing skin. They were life-threatening, too, those delicate social dances that taught us who and how to trust, who and what to be. If we weren’t careful, we would lose the suppleness of our youthful hearts, right along with our plump cheeks and rounded bellies. I stammered, unaccustomed to answering the question outside of the protected setting of a retreat. I thought of the past week. Rush coming home and slouching into the couch on the back porch, exhausted by the highs and lows of ministry that come in quick succession. Me crying on the phone to my mom that if I could be a writer without Facebook, Twitter, blogs, and the amalgam of an online presence, I would quit it all. We were tempted to harden, to stiffen, to ignore, and move on. reading the text when there’s nothing I want from it but God. I wanted this kind of spirit. I even prayed for it. Oh, Lord, let me rise like that dough, stretched thin but still whole, leavened by your yeast. Then no one would dare spit me out. Then I could feast on myself. Then I could be food for the world. I thought of this story after reading your post. I made the blog! This virtual medium cannot express how enthused I am! Take some quantum of solace in the tumult of your peripheral writing duties in my saying that this was really a highlight of the day. Let’s hear it for friendship! Truly, just for the knowing you, I am made better (for Mary, the baby, and the pup as well). What are you doing to keep your heart supple? Now that is a mighty, mighty fine question, requiring courage to ask it – and courage to answer. You strike me as a courageous person. Thank you, we need lots more of that. And for making look at whether my heart is supple.